It was his passion for non-language based performance that landed CSUN alum Stefan Haves a job as a comic designer for Cirque du Soleil's KOOZA. 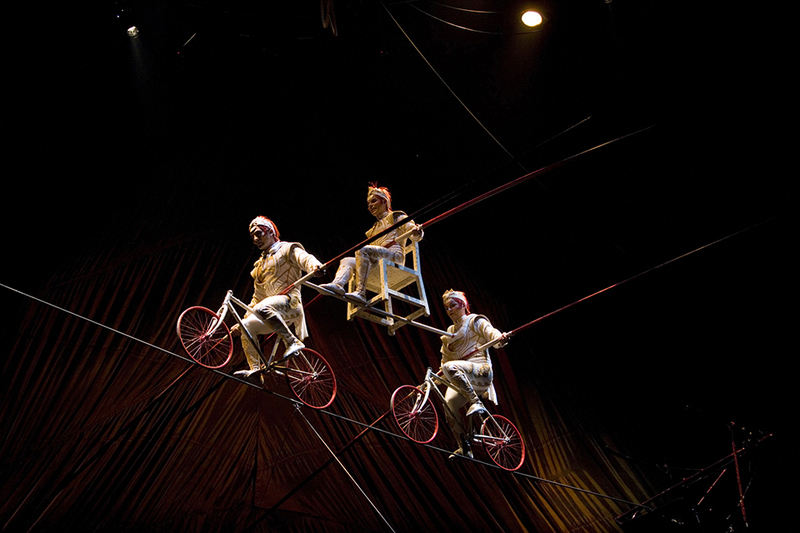 The show featured many signature Cirque du Soleil acts, such as the tight rope, photographed here. Photo by OSA Images and courtesy of Cirque du Soleil. Haves, comic act designer and casting partner for Cirque du Soleil, found his passion for comedy and non-language based performance while he was enrolled in Antonin Hodek's mask, mime and movement course at CSUN. Photo courtesy of Stefan Haves. KOOZA, the most clown-centric show Cirque du Soleil has done, tells the story of the Innocent (left) and his journey into KOOZA, a world created by the Trickster (right). Photo by OSA Images and courtesy of Cirque du Soleil. The 1,600-pound Wheel of Death — powered only by the two artists who leap and counter-rotate in a display of acrobatics and teamwork — is a staple in David Shiner's KOOZA. Photo by OSA Images and courtesy of Cirque du Soleil. 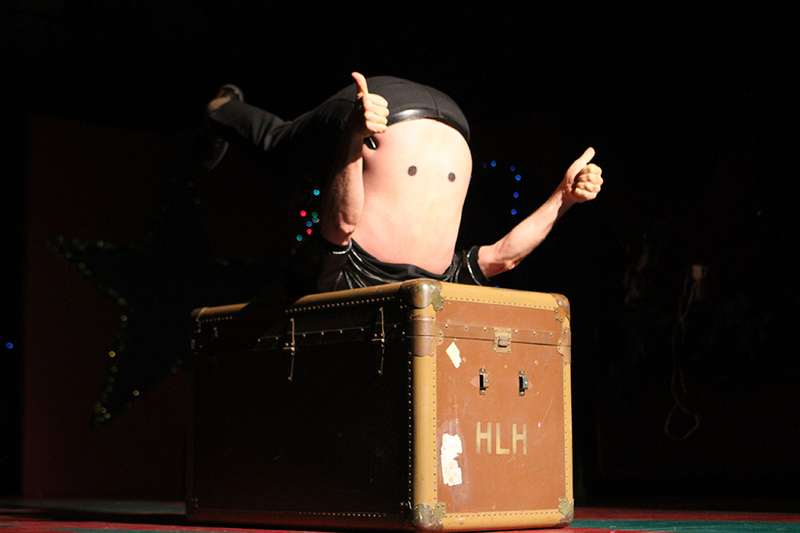 Following his passion for non-language based performance, Haves created a silent comedy contortion act called Back Man. Photo courtesy of Stefan Haves. The act, which Haves has performed internationally, won him $10,000 from a television show titled America's Funniest People. Photo courtesy of Stefan Haves. Stefan Haves ’82 (Theatre) wanted to create something universal, something that would be relatable no matter the audience. With that goal in mind, he realized his creation would have to be nonverbal. Haves begins this act by taking a seat on a block. Then, he removes his shoes, dropping each on the floor with a thud. He places his hands at the edge of the block, grabs onto it, takes two quick breaths, and swings his legs back and over his head so his back is facing the audience but his head is hidden — they laugh every time. Then, he pulls down his shirt to reveal two black dots on his back: his new eyes. His transformation is complete — Haves is now Back Man. Haves twists from side to side. Back Man “looks” to the left and then to the right, inspecting his audience. He shrugs. He pounds his fists in frustration — how can he communicate with the audience with no mouth? He raises his finger — he has an idea! Haves has performed his Back Man act internationally, accomplishing his goal and winning $10,000 on the television show America’s Funniest People. He also served as a creative consultant for David Shiner’s Tony Award-winning silent clown show Fool Moon and created an adaptation of Jack London’s novel The Call of the Wild, in which Haves used stilt walkers and masks to portray the tale’s humans. As a comic act designer and casting partner for clowns and characters, Haves begins his work by working with creators to flush out a storyline as well as visual and musical themes. Once the storyline is finished, the team creates characters which they cast shortly thereafter. Once the cast is finalized, Haves attends meetings and rehearsals until opening day. The path wasn’t always clear for Haves. His passion for performance, he said, was ignited during his sophomore year at California State University, Northridge, when he met an inspirational theatre professor. After college, Haves was torn between pursuing his passion for comedy and completing a Master of Fine Arts program he’d started at Brandeis University. Eventually, he moved to Paris, where he worked as a juggler and street clown. As fate would have it, Haves caught the eye of Shiner, the acclaimed Cirque du Soleil writer and director. Shiner, one of the best clowns in the world, according to Haves, asked the street performer to work with him on Fool Moon after seeing Haves’ unique vision and style. 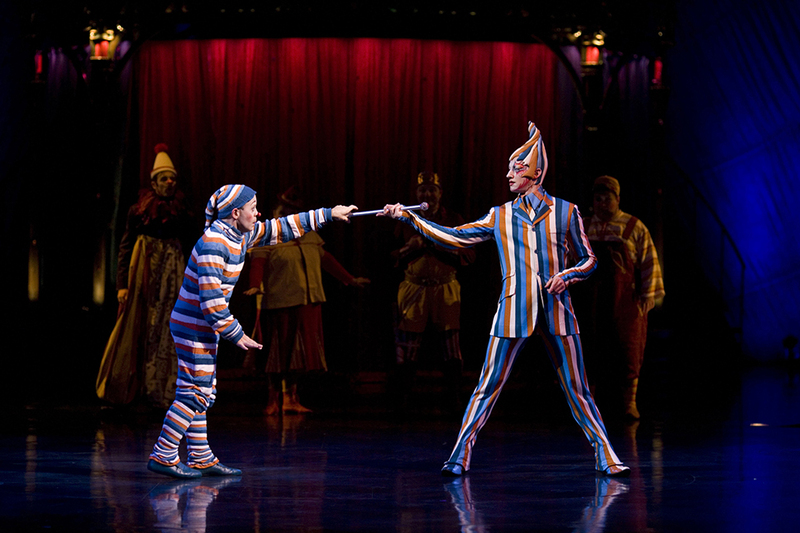 Years later, the two continued their professional relationship, working together on Cirque du Soleil’s KOOZA. The show, which marked a return to the organization’s roots, follows the Innocent, a naïve and childlike clown who is pulled into the world of the Trickster, the clown who created the KOOZA world. 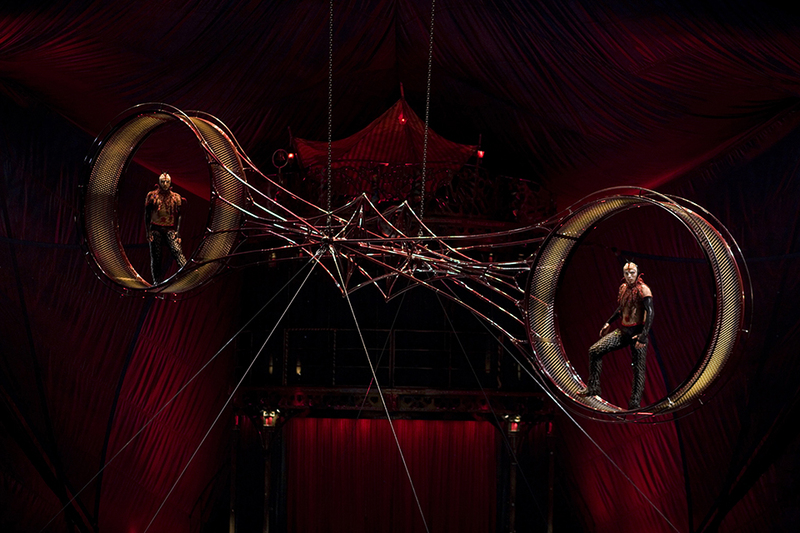 In the KOOZA world, audiences see acts like contortion, high wires, aerial loops and a 1,600-pound Wheel of Death — powered only by the two artists who leap and counter-rotate in a display of acrobatics and teamwork — which is positioned diagonally, starting at stage left and ending at stage right. The act is a break from the usual symmetry of performance and audience, bringing the action as close as possible to the audience. In recent years, Cirque experienced the audience’s reticence towards clowns. Haves is writing a book, Cirque It, about bringing the spirit of Cirque du Soleil into everyday life. It includes a section on coulrophobia (the fear of clowns), in which he explores the reasons people are afraid of clowns. “I get why people are afraid of clowns,” Haves said. “Our culture has demonized clowns: Clowns are equated with serial killers like John Wayne Gacy. In the 1970s, Woody Allen began beating up and making fun of mimes. Then you have Stephen King, who uses clowns to kill and scare people, and then you have a culture in which there’s no money or return on being a clown. 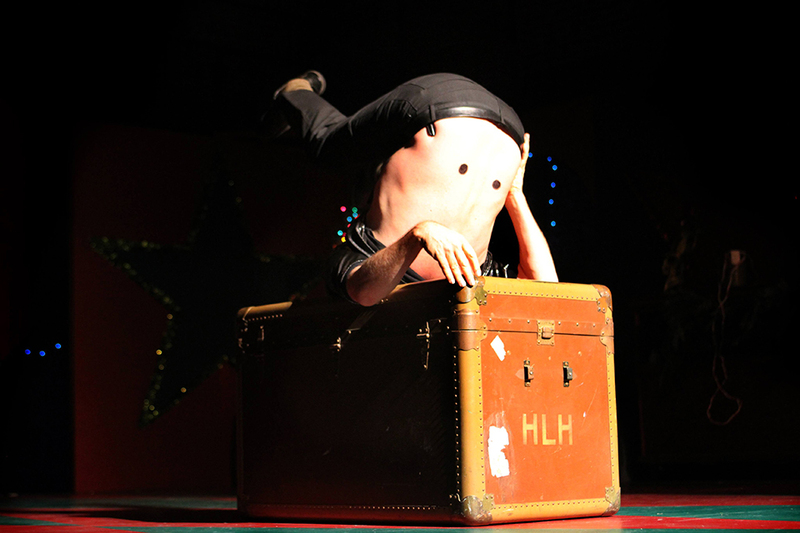 Beyond his work with Cirque du Soleil, Haves teaches clown classes, employing exercises Hodek taught him at CSUN, such as physical and technique exercises aimed at maximizing the body’s efficiency. 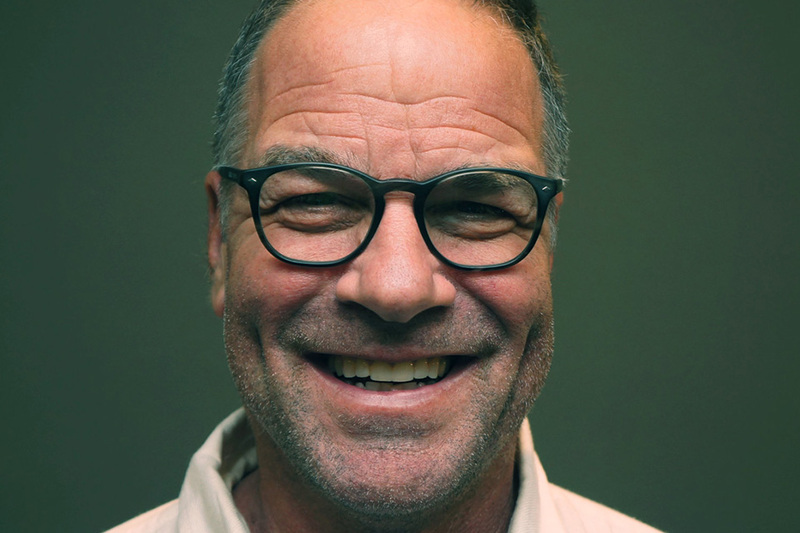 Decades after graduating, Haves still fondly recalls his experiences on campus. For a complete list of Haves’ work, visit https://www.linkedin.com/in/stefan-haves-0011484/ or http://www.stefanhaves.com/.